Innovative Building propels Vanderbilt University’s growth in applied research and entrepreneurial partnerships. 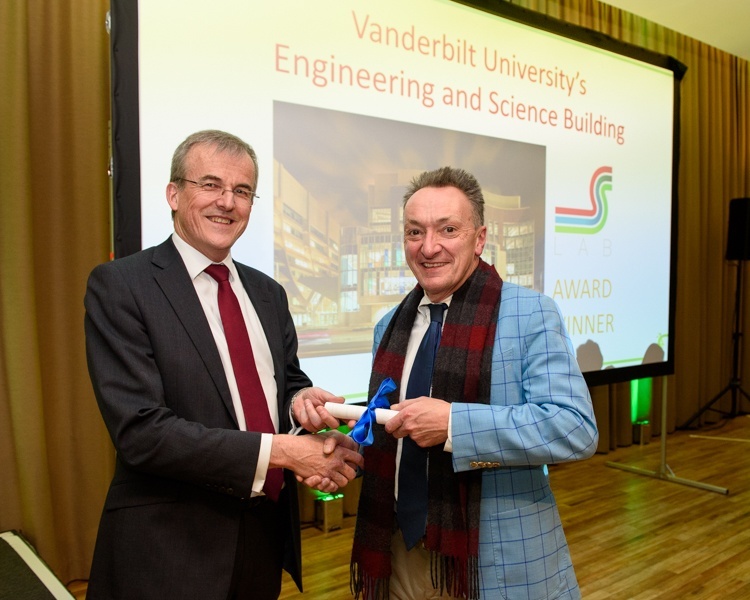 Wilson HGA has won an international S-Lab Award for the Engineering and Science Building (ESB) at Vanderbilt University in Nashville, Tennessee, in the Engineering and Related Buildings category. The S-Lab awards recognize excellence in science buildings, equipment, facilities, and management. Designed as an addition to the existing Olin Hall in the School of Engineering, the 230,000-square-foot, seven-story Engineering and Science Building (ESB) supports Vanderbilt’s goals to expand interdisciplinary research, recruit nanotechnology faculty, and create a new undergraduate research-focused culture. The building houses interdisciplinary research laboratories, nanofabrication clean room, imaging suites, core laboratories, classrooms, undergraduate commons, and Wond’ry Innovation Centre. Throughout, ESB promotes cutting-edge research and encourages interdisciplinary collaboration. John Sloop, Associate Provost for Education Development and Technologies Professor at Vanderbilt (R), and Peter James, Founder and Director of S-Lab. 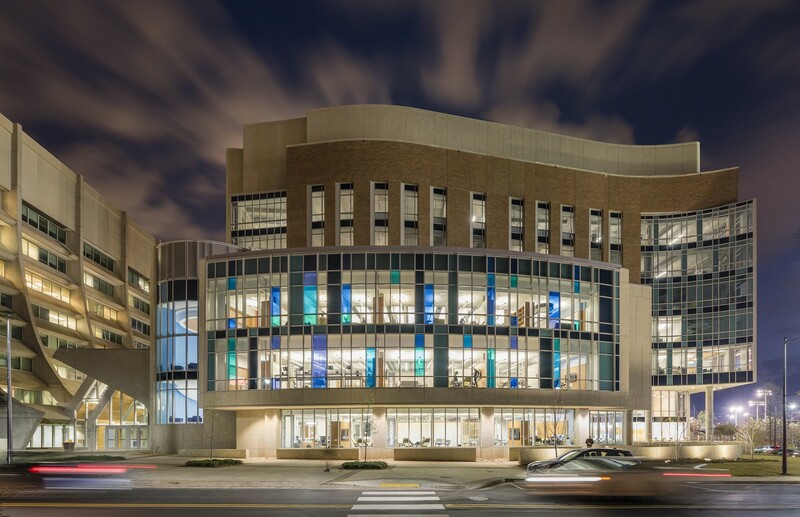 For instance, the three-story Wond’ry is designed to incubate ideas and connect students and faculty with technology transfer and industry mentors. The cleanroom and advanced imaging facilities provide capabilities for advanced discoveries in nanocomposites, smart materials, advanced energy storage, and nano‐bio‐technology. 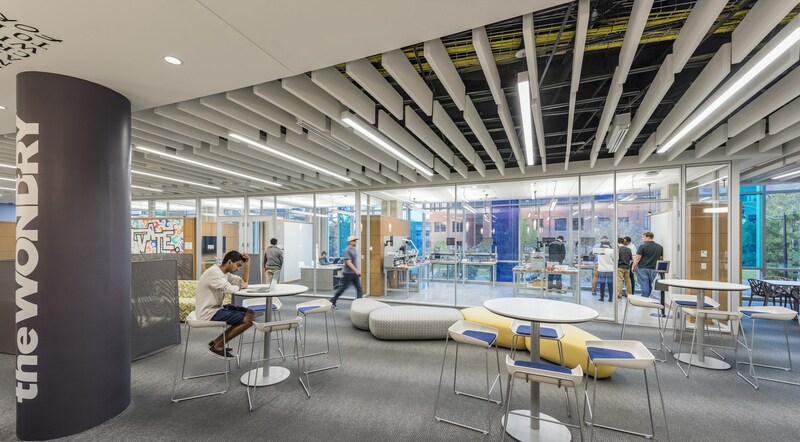 And the Undergraduate Commons next to the laboratories and above the Innovation Center connects students with researchers across the building. Based in the United Kingdom, S-Lab is a not-for-profit initiative that works with universities, research institutes, and other laboratory sectors to support best practice in laboratory design, operation, and management internationally. Award-winning entries were selected by an independent panel of experts with laboratory experience, including facilities managers, university funding bodies, academic and researchers, and independent experts. For more information, visit the 2019 S-Lab Awards.